It can be quite daunting to stare at a bare white room and try to decide what you want to do with it. We have of course decorated before but as this is the first house we have owned -not rented, we knew we could do exactly what we wanted when it came to putting our stamp on the place. The living room was the first room we wanted to finish (in time for the Christmas tree on the 1st! ), and it's always easier to tackle one room at a time. When we moved in we were of course left with the previous owners style -stripe wall paper and off white wall. While there wasn't anything wrong with it, after all...everyone to their own, it just wasn't very "us". So it was all stripped back and painted white. We had an idea of what we wanted to do and we also knew that somewhere we wanted to have a brick wall (which is now up and looks amazing!). That was non-negotiable! Planning an entire room in your head can be quite tricky so making a mood board can be a great help. Whether or not it includes the actual items you want in the room, it can help give you a sense of if it will all go together in the end. 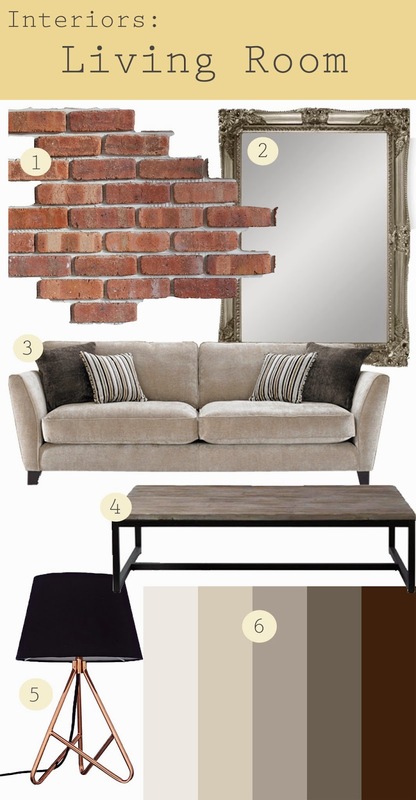 That's what I have done here, the brick and the sofa are ours and we are strongly considering the rest -I love the coffee table! I'm not a huge fan of everything matching so I love the look of the different metals together, also the slight industrial feel you get from the brick and the coffee table. It is such a great contrast with the comfy squishy sofa and ornate mirror. Do you have any help or advice for decorating?